Week 1 lines came out! I'll take OU to cover FAU. I don't know. Coach Kiffin knows about point spreads, he has mentioned them in his post game press conferences and even tweeted them! On a related note, naturally I am very happy that last week's Supreme Court decision opening the door for states to legalize sports gambling. We'll see if Congress does something either way, they want to have their hands in everything so we'll see. Season win totals and games of year lines are not out yet, they should be out this week. I really don't get serious about gearing up until mid summer, but it is coming. 94 days. Regular Season Over/Under Win Totals as of 6-11-18 from 5dimes. South Point in Las Vegas released their's in late May, many have moved .5 and full games from then. These are current as of now. At this early stage I am pretty interested in a few already. Glad you mentioned the South Point Casino Nebish. I stayed there my last Vegas trip and for the money and location, it was a good time. It's a ways from the strip but saving that extra time Sunday morning was worth it. The pool is nice and the bartender made a decent Mai Tai. As for 2018 college football, it's the usual suspects: Bama, Ohio State, Oklahoma, Clemson. The Caines will be tough but they'll lose a game they should win; that's CMR's track record. The team I think that will make some noise is Northwestern; coming off a 10-3 season with lots of returning players and the most under-rated coach in Pat Fitzgerald. Out west, UW will be the team to beat. CCP is the best coach in the Pac12. As for my Bruins, their record will improve over last year but they'll get spanked in some games. I see 8-4 at best. Here's to college football tailgates, the best parties ever! Nothing gets me more excited than looking at win totals although I am a month out from digging in. PAC12 South is super intriguing this year. NW and Iowa always seem to do better when expectations are low. Love Fitz. Hope Thorston is healthy. Wisconsin still rules the west but do travel to Evanston this year. I placed a lot of bets at South Point and was impressed with it. They are the only Vegas sports book to post win totals for every team. I've walked, Ubered and took the train everywhere on the strip and South Point is the only one that has them all. I like Northwestern getting three against Purdue. Just to piss off my in laws who live right across the street from Purdue's stadium. Being from Michigan I follow The Big Ten of course. I can't see Michigan or State winning 10 games so probably take the under on both. College football passion... it tops all others. New Jersey Governor makes first legal sports bet in the state! I think the thing about college football anticipation I don't like is the fact that it isn't even summer yet and we are already looking forward to fall. 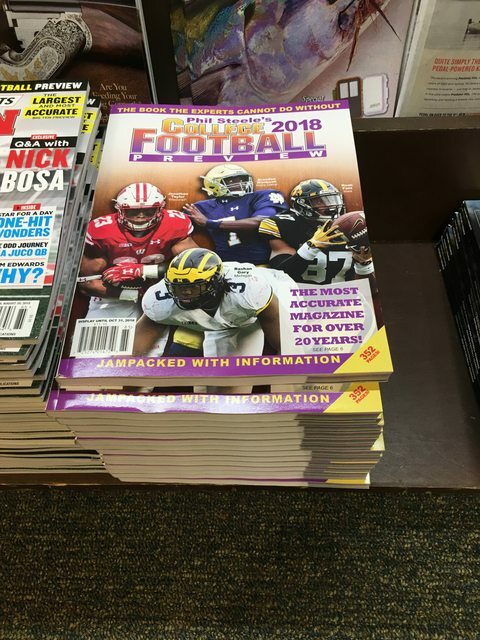 The 2018 Bible is in stores! Conference media days are upon us! Fall camps are about to begin! 36 days until first kickoffs Saturday 8/25! 41 days until Thursday 8/30 games! 43 days until the first full Saturday of action!!! Unfortunately I can't get the Pac12 Network (for all sorts of BS reasons and most of them rest with the conference). That being said, I had fun watching the SEC Media Days and related all this week. I enjoy listening to all the commentators and what they have to say. To good times this fall! My PAC12 Network solution was to have a family member out of state upgrade their cable package on Comcast to include some sports channels with the PAC12 Network and then I have their log-in so I can watch PAC12 Network through the Comcast or the PAC12 App. PAC12 Network and Big Ten Network are must haves! Do you have Sirius/XM Strat? I listen to channel 84 ESPNU alot and they advertise PAC12 and SEC specific channels but I haven't tried those yet. Having a hard time finding that particular issue since they are regional. That's the one I want because there's a Michigan player on the front. It's funny because people around here are questioning why no Ohio State player is on the cover. Send me your address and I will mail you one from here with Gary on the cover. New for 2018, the Sun Belt has split into East and West divisions this year and will have a Championship game 12/1. Cool! Check your PM's. Thanks! I love the over/under on South Carolina win total ay 7.5 and projected 3rd place finish in the East. USuC fans have drinking the Muschump Kool-aid where he claims to be doing special things to bring in championships. I've heard this **** for 50 years and nothing changes. EfF the Gamecocks and Go TIGERS!!! So do you want the over or the under? Dan always hates South Carolina. So does our friend hoffcl, he used to call them "the team from the state under North Carolina". One is a Clemson fan (going for 5 straight over SC this year) and the other is a Georgia fan (the last in the series 3 Georgia has won by 14 or more). I think SC can be good, but they were 9-4 last year, just 5-3 in the SEC. How much better can they be? They were 6-1 in one score games last year and won 3 games in which they were outgained in yardage. So SC may have to be improved this year just to go 5-3 in the league again. Don't forget SC has lost 4 straight to UK!!! Still alot of people are high on SC this year, either because they think Georgia may take a step back or because they like Bentley. Bentley year 3 has potential to have his best year yet. New OC promoted from the staff. SC has some weapons to work with, but Bentley didn't play up to expectations last year so he will need to rise his game. Everyone knows that Muschamp teams can typically play some D, it's just the O on his watch never pulls their weight. After Georgia the SEC East looks like it is anybody's division to challenge the Dawgs. I have heard media people saying they think SC can beat Georgia, which maybe they can. I've also heard people say SC can win the East, that I'm not so optimistic on. I think this time of year people just want to look for something up and coming and different. SC usually disappoints in that regard. Maybe 2018 can be different? Agree. Same when Spurrier came here. They were just natl championing all over themselves. That Clemson game is just as important as the 5 in a row thing is all the talk already. I myself am a huge fan of whoever I got that week.